–Harriet Van Horne, “Not for Jiffy Cooks,” Vogue Magazine, 1956. 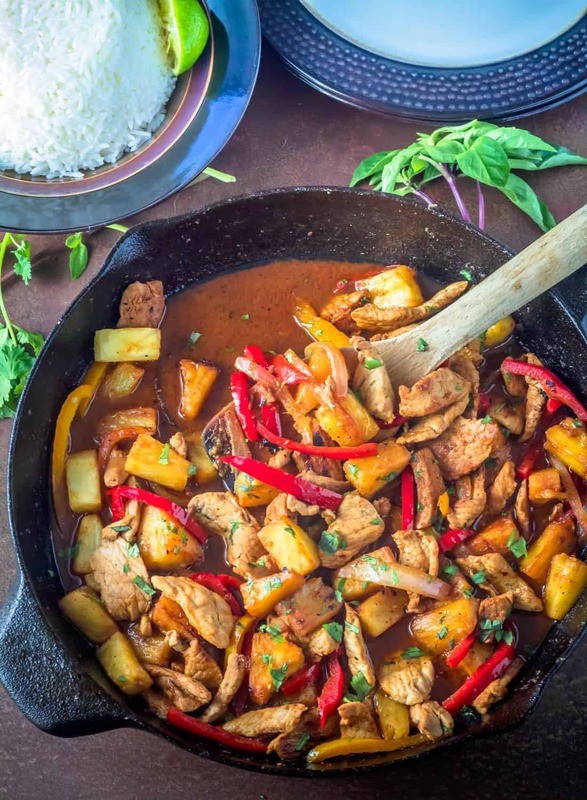 This past Sunday, we decided to try a new combination – pork and pineapple in a Thai red curry sauce. I guess I figured that if the sweet and sour flavors of a well known Chinese dish “work,” they might play well together in a Thai curry. My hunch was correct! 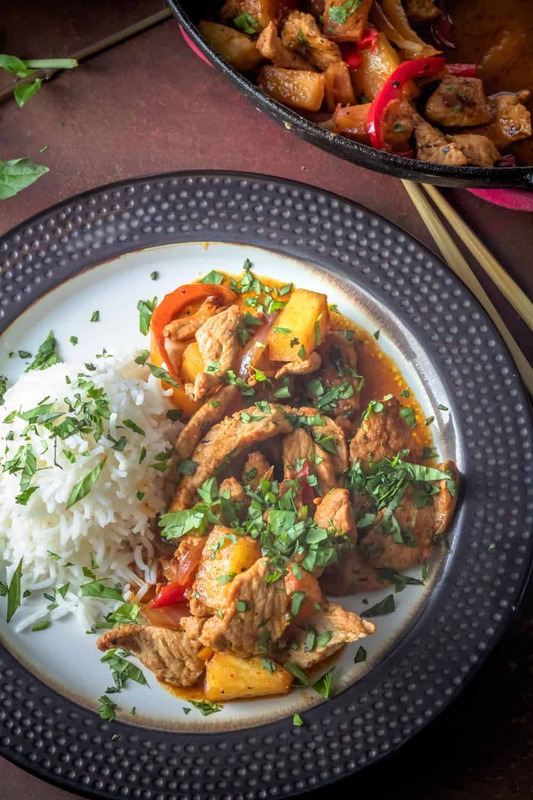 The acidity of the lime juice, the sweetness of the pineapple and coconut milk, and the savory flavor of pork and fish sauce come together beautifully in this spicy curry dish. It is always interesting to observe the family dynamic and how this process plays out in the kitchen. I have ADHD, as does my son Gaelen. “Mom, focus!” is gently directed my way as the clock ticks closer to 8:00, and hubby has PMS (pre-meal syndrome). Evan works at Verizon, is on his feet all day, and frequently is glued to a bar stool. Kelsey is such a good sport, and is always willing to take on the onerous task of picking through piles of cilantro – one of her favorite ingredients. Sarah is usually game for anything, but she and Kelsey are the newbies in the kitchen. My husband Mark usually tries to stay out of the way unless the grill or smoker is involved, especially when Gaelen is flinging food in a wok. Sunday, Kelsey picked through a veritable mountain of marginal cilantro, Evan broke down the slightly under-ripe pineapple, and Gaelen put his excellent knife skills to work thin slicing the partially frozen pork loin. I am typically responsible for creating the sauce, though Gaelen usually finds it needs more garlic and ginger 🙂 . We make a formidable team in the kitchen! At this point, my kitchen was in complete disarray, grease had popped all over everything within a 3 foot radius, and we were ready to get our show on the road. I highly recommend having all of the ingredients prepped and in appropriately sized bowls, and the rice simmering prior to starting the stir-fry. It will come together quickly, and you don’t want to be waiting on ingredients. I typically cook the pork (or chicken, shrimp, beef, etc.) separately from the vegetables, remove them from the wok, and set them aside. A crowded wok prevents nice browning, and will compromise your results. Unless you’re making a huge quantity, cooking the meat in one batch, the veggies in another, and combining just prior to serving with the sauce ingredients works well. P.S. Evan did clean the range before he left Sunday! Use prep bowls! 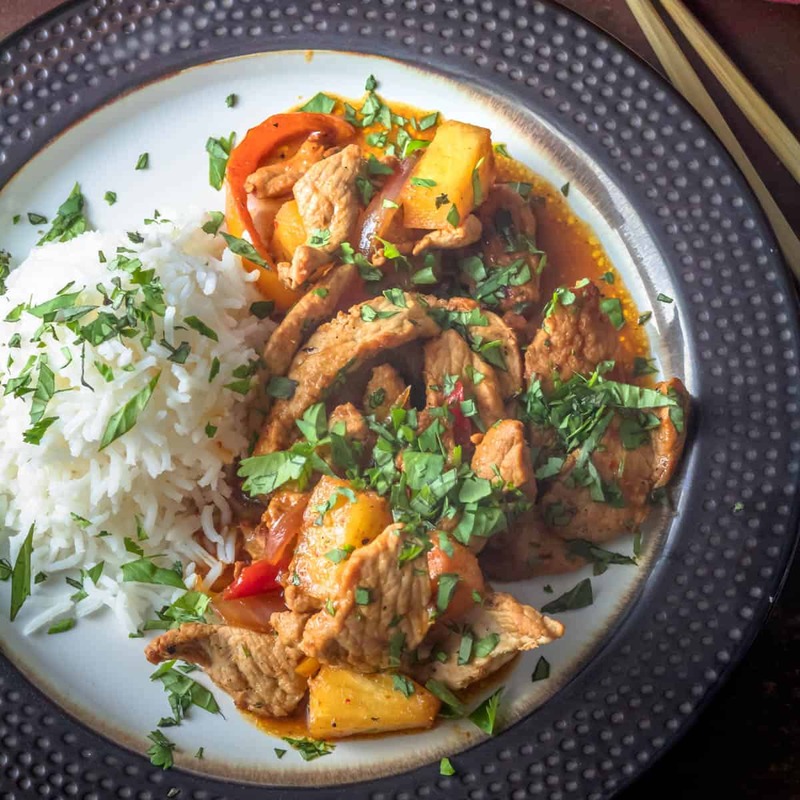 For this recipe, you will have about 1/2 cup chopped cilantro (more for garnish), 1/4 cup chopped scallions (for garnish), about 2 cups each cubed pineapple, bell pepper strips, a medium-sized bowl for the thinly sliced pork, and a bowl large enough to whisk over 2 cups of sauce ingredients. Use a microplane to finely grate frozen ginger after removing the peel. Slicing the pork thin requires a very sharp knife. You may need to sharpen your knife before you get started. I find that about 1/4 cup uncooked rice per person is about right with a curry. However, leftover rice is always great for fried rice another night. Plan accordingly. Heat level is a matter of personal preference. I suggest starting with 2 Fresno chiles and 2 tablespoons red curry paste. You can add heat, but you can’t subtract heat. You may want to start with less if you’re serving people who can’t handle the heat! This recipe calls for the zest and juice of 1 lime. I prefer to use kaffir lime leaves, but I either have to special order them from our local natural foods market, or rely on my Thai pedicure provider to bring them from an Asian market in LA. Feel free to substitute 2-4 kaffir lime leaves to the dish if you wish. Remove prior to serving. Once again, I must refer back to my well-stocked pantry. I keep coconut milk, soy sauce, fish sauce, Thai red curry paste, tamarind paste, ginger, garlic, etc. on hand. A sweet, savory, and slightly sour spicy Thai curry to please your palate! In a medium saucepan, combine rice, water, and salt over high heat. Bring to a boil. Reduce heat to very low. Simmer 20 minutes. Turn off the heat, and leave covered until curry is ready to serve. Combine sauce ingredients - coconut milk through chicken broth - with a whisk until smooth. Set aside. On high heat (with vent on,) add 1-2 tbsp. oil to the wok. Add 1/2 the ginger and 1/2 the garlic to the wok. Stir-fry, being careful to not burn! When the mixture begins to turn golden and fragrant, add pork. Stir-fry until the pork is nearly cooked and edges are browning. Adjust heat if the wok is too hot. Remove pork mixture back to prep bowl, and set aside. Carefully wipe wok with paper towels to prepare it for the pineapple and peppers. Add the remaining oil to the wok. If you've turned the heat off, bring the heat back up to high. Add bell peppers, pineapple, and Fresno chiles to the wok, along with the remaining garlic and ginger. Stir-fry 3-4 minutes until the pineapple begins to caramelize on the edges. Add the combined and whisked sauce ingredients and the pork mixture to the pineapple mixture in the wok. Stir well to combine, 1-2 minutes. Taste for heat level. You can whisk a bit more curry paste into the wok if it needs more heat. Add the chopped cilantro. Stir well. Turn off the heat. 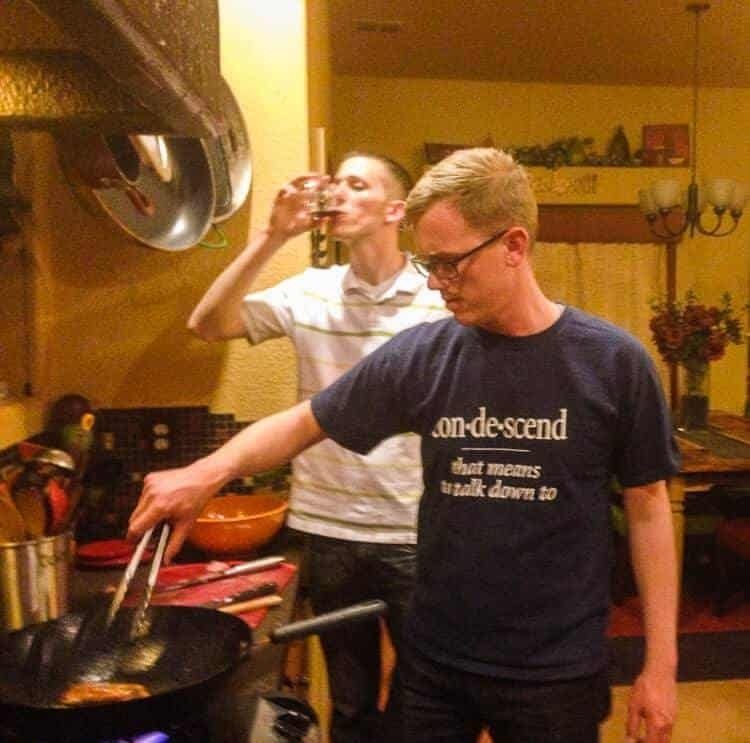 Serve over rice. Garnish with additional cilantro and scallions. I believe in portion control. This recipe allows for 4 ounces of pork per person, and 1/4 cup uncooked rice per person. If you're uncertain about the heat level, start with less and add to it if desired by whisking additional curry into the sauce. Fresno chiles add a slightly sweet heat to this recipe that is really nice. You don't have to use them if you can't find them. It will still be delicious! Stir-frying the pork and removing from the pan keeps the pork from being "boiled" in the pan juices, and you'll get nicely browned pork (and the maillard reaction) adds flavor! Macronutrients (approximation from MyFitnessPal.com): 448 calories; 29 g protein; 58 g carbohydrates; 12 g fat. That was a really fun night in the kitchen! The pork fat was incredible. "Oh, so you've had bacon? Here, try this."